Mobile app development continues to grow year by year, and we can predict that 2019 will be no different than the years before. Here are 10 mobile app development trends that will shape the industry. We’ve noticed that our clients are getting more and more interested in developing innovative mobile apps. We also want to keep an eye on the latest technology trends shaping mobile landscape, trending programming languages, or crucial security updates. Now, we want to share these trends with you in this article. We’re covering the tech-side of mobile app development, as it shapes the way the apps are being built, be it a messaging, travel or shopping app. Augmented reality apps have grown significantly over the recent year, with success of AR apps like Pokemon Go, AR filters enhancing experiences of various social networks, and apps for businesses like the one IKEA created with Apple. This year, with ARKit on iOS and ARCore on Android, we will see further advancements in this technology. These frameworks allow programmers to use devices’ sensors to map the surroundings and place virtual objects in it. Hence, AR will likely be used more often to showcase and promote products. A good example of marketing efforts using AR technology is the Welcome to Marwen app, which promoted Robert Zemeckis’ latest film before its release. It uses the abovementioned tools (ARKit and ARCore) to display a movie scene on any surface, so users can investigate it from different angles, learn more about the characters and the movie itself. The advancements in AI change the way we interact with mobile apps. Virtual assistants like Siri, Cortana and Google Assistant can now help us with gathering information, organize our schedules, book an appointment or optimize our productivity. The developments in Natural Language Processing and machine learning make virtual assistants more contextually aware, making their responses better and more accurate. At the same time, big companies like Facebook, Microsoft, Google and Amazon invest in solutions based on machine learning to create better conversational interfaces. We’ve already seen apps that used neural networks and AI to create what other thought a simple filter could do. The effect was stunning and we can expect other app developers to experiment with similar solutions. Today, AI becomes more than just a virtual assistant, as it tries to simulate a human friend. The Replika.ai app is a great example of the latter. In 2019 mobile app security remains one of the most important trends. The general growth of the industry, billions of users, 3rd party SDKs and the vast number of user data being stored by the companies made a security a top concern for mobile app developers. We’ve already seen a growing trend of encrypted messaging apps like Telegram, mobile browsers protecting users’ privacy and an industry shift towards protecting user data, including Apple’s App Transport Security (ATS) and Google’s efforts to improve app permissions. At the same time, both companies included automatic security updates for their OSes. We’ll definitely see more improvements in mobile security in 2018, especially in mobile payments, data encryption and privacy protection. In 2018 users worldwide got used to using the on-demand apps. And I don’t only mean the ride-hailing industry precursors like Uber and Lyft. On-demand apps are taking over other types of services like cleaning, delivery, laundry, shopping or making appointments. The trend will continue to grow as users like the conveniency, speed and payment methods offered via the on-demand apps. As they make everyday tasks way easier, we will see more and more industries trying to leverage the gig economy. Mobile payments and payment gateways are becoming increasingly significant, as the number of users purchasing online grows steadily every year. Ecommerce, travel booking services, on-demand applications all depend on mobile transactions. This increased growth of mobile payments will impact security even more, as brands will have to ensure secured encryption while implementing mobile wallets and payments in their apps. According to the IDC, almost half of IT spendings in 2018 were cloud-based. In 2019, we will continue to see growing numbers of tools and services based on the cloud. The growth will include Software-as-a-Service, Infrastructure-as-a-Service and Platform-as-a-Service. With mobile cloud computing (MCC) solutions, the idea is to offer rich mobile apps and seamless user experience on a variety of devices. This will benefit companies that want to serve their users on mobile, but require more computing power, which could slow down the experience on these devices. A good example are mobile healthcare apps that need to process information to provide a remote diagnostics as part of their services. Loading speed is still a crucial factor for mobile users. In order to improve it, Google has introduced Accelerated Mobile Pages. It is an open source project aiming to improve mobile browsing experience. You can easily recognize AMP-based website searching Google on mobile, as they are marked as such. Web developers, businesses and publishers will need to consider this solution, as it not only improves the user experience on mobile, but is also an SEO factor (AMP websites rank higher in Google). At the same time, it is cheaper to develop and maintain the AMP than building a native or hybrid mobile application. 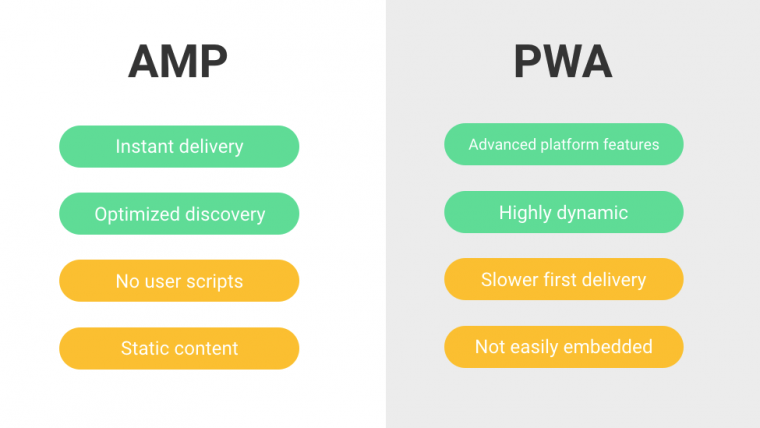 Progressive Web Apps (PWA) have been dubbed the next generation of mobile web apps. They are free from constraints of mobile websites like slow speed and the need of constant Internet connection. PWAs bring a native-like feel with features including offline and full screen modes, a homescreen launcher, an access to the camera and push notifications. Plus, they are faster and consume less data than mobile websites. Progressive Web Apps don’t require downloading and installation, which is the answer to mobile fragmentation and multiple operating systems. A good example of a global brand that decided to build a cross-platform Progressive Web App is AliExpress. The owners of this online marketplace noticed that their mobile commerce grows three times faster than ecommerce, and wanted to improve the experience on mobile. Implementing PWA resulted in 104% more users on mobile and a 82% increase in conversion rate on iOS alone. Considering the high number of mobile applications in the app stores, Google realized how daunting it is for the users to download and update new apps every now and then, for different purposes. That’s why the company introduced its Android Instant Apps. With Android Instant Apps users can download only the most needed parts of the application, accessing the rest of the content instantly through the URL, saving space on the device. Android Instant Apps are being developed simultaneously with Google’s Progressive Web Apps. Vimeo, a video-streaming platform, used Instant Apps to reduce their Android app weight from 15MB installation package to a 4MB feature module. The app got rid of some libraries and used smaller image caching library. As a result, the app offers better experience on Android devices, and the company saw a 130% increase in video sessions. Chatbots became an integral part of communication apps like Slack, Facebook Messenger or Telegram. Companies like Intercom offer them as a part of their services to help brands interact with their customers 24/7. And it’s easier than ever to build one’s chatbot using chat builders, ranging from the likes of AWS Lex, which may require some programming knowledge, to more straightforward builders that use existing components. With multiple integrations and simple and affordable chat builders, we will see more chatbots driving conversations between consumers and brands in 2019. These trends definitely shape how mobile websites and applications look like today. Whether you want to create the next chat app, photo-sharing platform or carpooling service, many of these trends are applicable for you. Do you want to build a mobile application for your business? Take a look at our react native development services and let us do the code! How to find tech trends that really matter in the sea of buzzwords and catchy headlines? Pay attention to what the biggest names in tech say.